Read over the history of pajamas below. See also: Pajama FAQs and Pajama Glossary. An evolution: Pyjamas to Pajamas, the Union Suit to Long Johns, Footie Onesies & Footed Pajamas for kids to Adult Footed Pajamas by Big Feet Pajama Company. Pajamas, or pyjamas often shortened to PJs, jimmies, jimjams or jammies, can refer to several related types of clothing. Pajamas are loose-fitting, two-piece garments worn chiefly for sleeping, but sometimes also for lounging, also by both sexes. More generally, pyjamas may refer to several garments, for both daywear and nightwear, derived from traditional pyjamas and involving variations of style and material. During the middle ages people began wearing simple nightshirts. The worldwide use of pyjamas is the result of adoption by British colonists in India in the 18th century, spreading to Britain and their colonies and western world through the 19th century. The word pyjama stems from the Hindi word paejama, meaning “leg covering”. The word pyjama became pajama in the Americas, however pyjama is still primarily used through the rest of the world. Union Suit is a type of one-piece long underwear. Created in Utica, New York, United States, it originated as women's wear during the 19th-century United States clothing reform efforts, as an alternative to constricting garments, and soon gained popularity among men as well. The first union suit was patented in 1868 as "emancipation union under flannel". Traditionally made of red flannel with long arms and long legs, it buttoned up the front and had a button-up flap in the rear covering the buttocks (colloquially known as the "access hatch", "drop seat", "fireman's flap” or “bum-flap”.) Union Suits remained in common use in North America into the 20th century. As its popularity waned, it became chiefly working men's wear, increasingly replaced by two-piece long underwear, also known as "long johns". For simplicity the union suit and long johns were worn alone at night becoming the pajamas of the times for many. It was not uncommon until the mid-20th century for rural men to wear the same union suit continuously all week, or even all winter. Footed pajamas for kids, also called footie onesies or blanket sleepers is a type of especially warm sleeping garment made of warmer materials like fleece and worn primarily during the winter. In 2005, Big Feet Pajama Company began designing and manufacturing one piece footed pajamas for adults in fleece, cotton flannel and a cooler cotton jersey knit for year around wear and comfort. 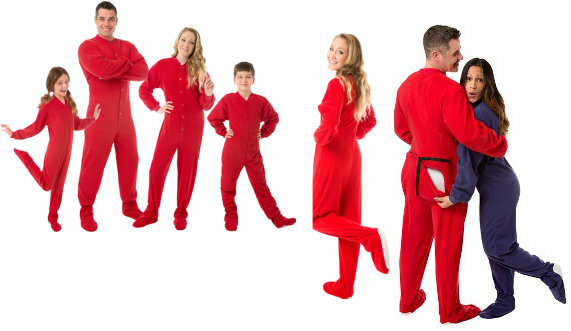 These adult footed pajamas are the traditional one piece and are offered with or without the drop seat. In 2008, due to customer demand, Big Feet Pajamas began producing pajamas in Infant, Toddler, and Youth sizes of their most popular styles allowing the entire family to have matching pajamas.